The risotto I remember from childhood was thick, creamy and loaded with butter and parmesan cheese. As a kid, I thought risotto only came in shades of beige with maybe a few flecks of green if my mother decided to throw in some fresh thyme for garnish. As a now chef, with a specialty in plant-based cuisine, I’m happy to report that risotto can be colorful, easy to make (I promise) and even healthy. 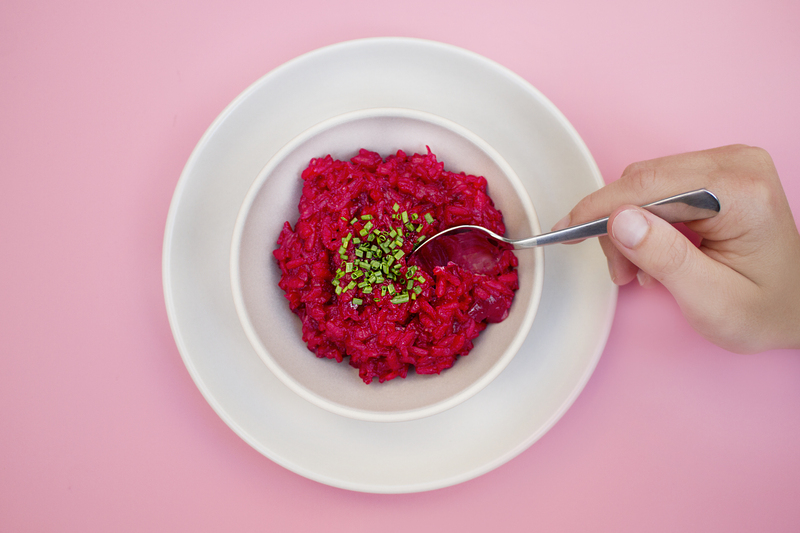 This gorgeous pink-red risotto will wow the taste buds and eyes. Now let’s talk nutrients. Vegetable broth adds loads of flavor, a subtle saltiness and extra nutrients. Beets are a beautiful bright pink and red root vegetable. They are a great source of fiber, vitamin C, magnesium and potassium— and while some adults either love them or hate them, it’s important to allow your little one lots of exposure to this root vegetable! (Even adults who are normally “meh” on beets will be wowed by this dish, the beet flavor is not overwhelming but rather adds a subtle sweetness). Tomatoes are a bright red, edible fruit that belong to the nightshade family. Tomatoes contain an antioxidant called lycopene, which is extremely valuable in reducing the risk of heart disease and cancer. Tomatoes are also high in vitamin C, potassium, folate and vitamin K. Arborio rice, an Italian short grain rice, adds an extra dollop of protein and iron. Whether you’re making this as a festive addition to a holiday meal (we’re thinking Valentine’s Day, Cinco de Mayo, Christmas, New Years…ahhh the possibilities) or if you’re making it as a colorful addition to your family dinner, this will satisfy everyone at the dinner table. Bright red, delicious and packed with nutrients. Our red risotto is guaranteed to please. In a medium sauté pan, combine olive oil, diced onions and diced beets. Sauté over medium heat, until the onions and beets are soft. For faster cooking time, place a lid over the sauté pan to allow the beets to steam. Once the onions and beets are soft, add in the diced tomatoes and sauté for an additional 2-3 minutes. Remove the pan from heat, and place the onion, beets, and tomato into a blender and blend until smooth. Set aside. In a medium sauce pan, add in arborio rice and sauté the dry rice over medium heat for 2-3 minutes, allowing it to toast slightly. Add in vegetable broth 1/2 cup at a time, making sure that the liquid is fully absorbed before adding another 1/2 cup of broth. Once the rice has absorbed the final 1/2 cup of vegetable broth, add in the pureed onion, beets and tomatoes, and mix well. Keep over the heat for 2-3 more minutes, then remove from heat. If desired, garnish with fresh chopped chives, then serve.